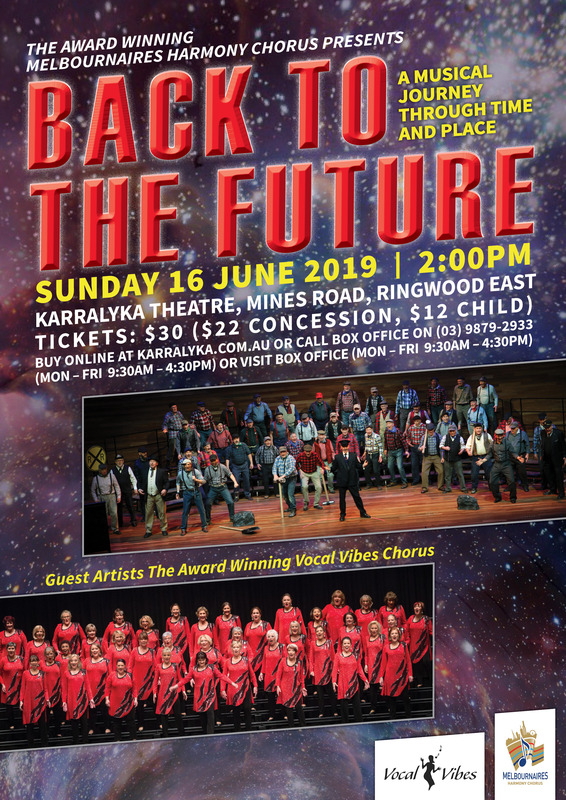 Melbournaires - 16/06/2019 - Melbournaires Showcase Concert - "Back to the Future"
Melbournaires Showcase Concert - "Back to the Future"
Travel with us to yesteryear, visiting places around the world to exerience the greatest harmony songs of all time, which remain popular today, as we bring them back to life. The Melbournaires Harmony Chorus, together with special guests the Vocal Vibes chorus, and associated quartets, perform an extravaganza of celebrated melodies from the 1800s to the present, in unaccompanied four-part harmony style. The narrative follows the adventures of a "Hippie Time Lord", through past decades and locations, encountering various groups of singers along the way. Comedy, pathos and history meld together, and you should be prepared to groan, laugh, and even shed a tear as the pageant unfolds.